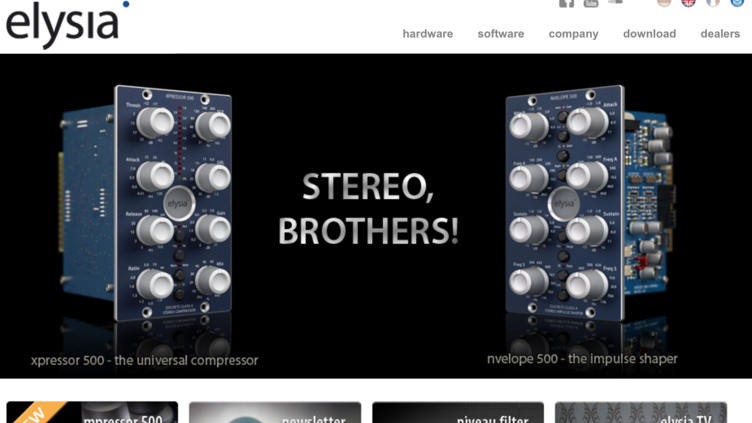 And here comes the mpressor 500 on stereo sources! Enjoy this brand new video and check out The Compressor From The Future with lots of different signals - both in standard Left/Right and in Mid/Side, too. And here is a very nice review of the karacter rack on Sonic Scoop... enjoy it, and have a very nice weekend, everybody! Enjoy the first episode of The okpk Session which is all about enhancing the drums in this very nice track. The video closes with a revealing A/B - don't miss it! Have you ever wondered what elysia's unique Gain Reduction Limiter is all about? This video has all the answers for you: What it is, how it works, and how to use it. Enjoy this very special compressor feature! ... and here are some examples to give you a first idea of what this super creative plugin is capable of. Enjoy! How to really immerse the listener into an acoustic space? And how can compression and equalization be used to support this? The second part of our interview with Philippe Teissier Du Cros discusses his view on the mixing process... let the Architect of Sound inspire you by explaining his personal approach! Here is another special feature of this video project: Simon Philipps remastered the complete “Soothsayer” track by his incredible Protocol band. One more time, the complete audio processing has been exclusively done with analog outboard processors by elysia. We'd like to sincerely thank the great people who made The Simon Phillips Session possible! Exclusively for this video project, Simon Phillips himself remixed a very cool track called “Catalyst” by his amazing Protocol band. The complete audio processing during this remix has been done with analog outboard processors by elysia – nothing else. Enjoy it!